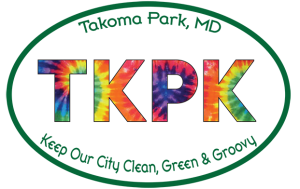 The City of Takoma Park works on initiatives that help keep the City “Clean, Green, and Groovy!” by eliminating litter. 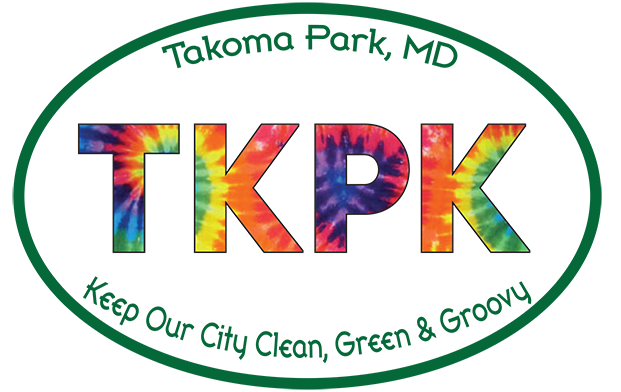 Sporting this car magnet tells the world you pledge to keep Takoma Park clean, green, & groovy! April is Anti-Litter Month in Takoma Park. This is the best and easiest time to find a way to join the effort to rid the City of litter. School groups from elementary all the way through the university level have clean ups scheduled. The Takoma Langley Crossroads Association and Main Street Takoma have regular clean ups advertised on their websites. The Alice Ferguson Foundation hosts the Potomac River Watershed Clean Up with sites all over the region. Many residents make Friends of Sligo Creek’s Sweep the Creek a tradition in the spring and fall, you can too! Adopt-a-Spot allows individuals or groups to adopt areas located within Takoma Park for regularly scheduled litter pick-ups. The City recognizes the individual or group with a sign bearing the group’s name at the spot. The City will also provide cleaning equipment, such as trash bags and gloves. Examples of eligible locations include parks, landmarks, schools, vacant lots, walkways or trails, campuses, public grounds, or any sites prone to litter. To fill out the Adopt-A-Spot Application online please visit this link.